Students take a test, then they learn the material, then they take the test again. 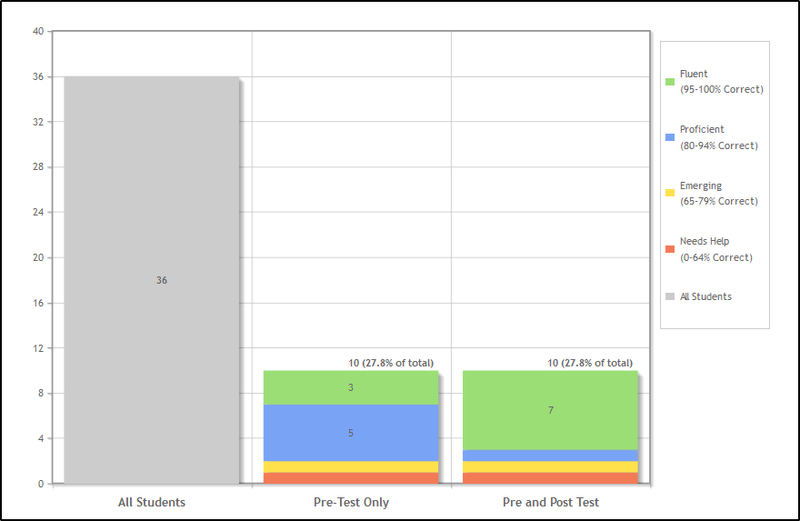 We want to show the improvements in the students who have pre- and post-test data. 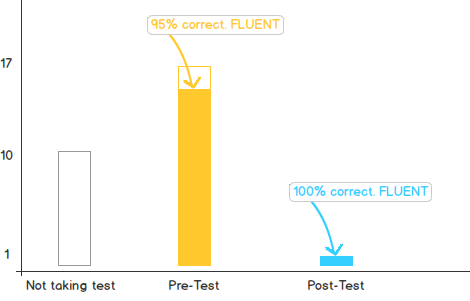 This graph shows the results, but it's very misleading because in this case, only one student (of 27) actually took the post test, and he got a 100%. But I think most people looking at this would think that it means that the whole class got 100%. You display the number of participants as bars, but the success rate is the filling of a bar. Also you may check ds3.js. They have lot's of ideas on visual representation of complex data. "We want to show the improvements in the students who have pre- and post-test data." 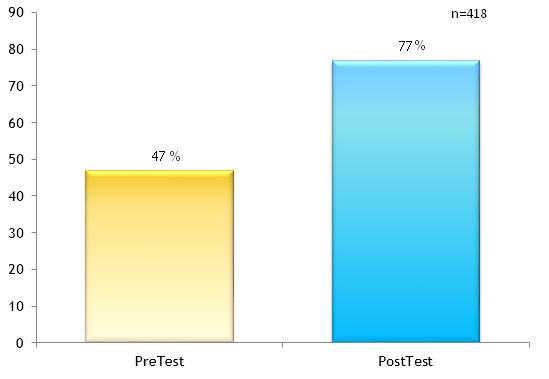 If that is the ultimate aim of this graph, to show the difference over two tests, then there's no point in graphically showing those who've taken only one part of the test or none of the tests - these can be summarised in a corner/outside the chart with some text (i.e. not started - 17, not completed - 12) And that in turn makes for less stuff to plot which is good. The best tip about designing graphs that I can provide is to have a very and simple message that you can see from looking at the visual representation of the data, otherwise it defeats the purpose of clarity in communication and becomes a visual design exercise. Having too much information often means you have to look at other graphs anyway because it is hard to understand or misleading to look at the same graph. Also think in terms of the most common scenarios of the data that you are likely to get, and the patterns/trends you want to look for (or are important) when you are design the graph, so that the most meaningful design can be implemented. When you have a lot of information a compromise is often required to juggle the different types or volume of data. If what you have with the difference between people that take the pre-test/post-test is often very similar then it is not so much of a concern. The number of people that take the test is the issue when it comes to averages, regardless of what type of test it is, so that's an issue with when it is meaningful to display averages and how to compare them. Probably the best way to start is to create single view of the data, then decide which combinations of the data gives the most insightful visual representation of the information rather than how to combine them all to start with. Also keep in mind that you may want to make other types of comparisons once you start accumulating more data over time, and you may want to see historical comparisons and maybe the same graph isn't useful for that so you need to redesign to make the visual presentation consistent. After thinking about it for about a year, I realize that a simple average doesn't provide me with enough information. For instance, I am interested in how many students score below the average, fail, perform to mastery, etc. So I would want a more complete grade distribution chart. You don't mention the format of your charting, but if drilling down was available then the distribution could shown by clicking on either bar. If drilling down isn't available then the grades distributions could be displayed below the chart you first display or in another section of the report. Also of interest could be the number of students who perform to a mastery level on the pre-test. It uses a stacked bar chart to show the categories, and it also shows the entire population, so it's easy to see the relative sizes of the categories, along with the breakdown at each of the second and third phase. Not the answer you're looking for? Browse other questions tagged info-visualisation graphic-design graphs data-analysis or ask your own question. How to analyze Pre/Post Single Ease of use question data?